In this paper, we take up the subject of epiphany in digital games, inspired by Espen Aarseth’s claim in Cybertext that epiphany serves as one half of a “pair of master tropes [that] constitutes the dynamic of hypertext discourse: the dialectic between searching and finding typical of games in general”. This article investigates the continuities and discontinuities between the literary epiphany and the hypertext epiphany, and subsequently theorizes the different types of epiphanies that occur in various digital games. We argue that epiphany in digital games is experienced by the player instead of the fictional protagonist, and that this experience can be brought about by ludic or narrative elements (making either a ‘ludic’ or a ‘narrative epiphany’), or by the collaboration of those elements (a ‘ludonarrative epiphany’). In addition, we distinguish between epiphany on a ‘local’, meaning small-scale and context-specific, and a ‘global’ scale, pertaining to the entirety of the game system. 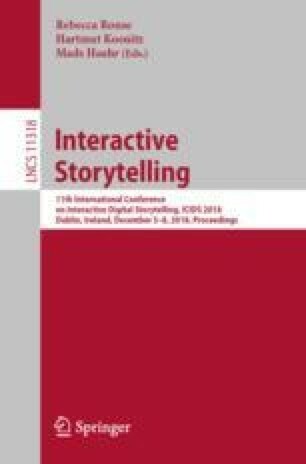 We conclude that an improved understanding of epiphany in digital games contributes to the maturation of digital games as a medium, since it allows both designers and scholars to better understand the medium-specific ways in which games can evoke certain feelings and emotions within their players.